A Star Is Born is a 1954 American musical film written by Moss Hart, starring Judy Garland and James Mason, and directed by George Cukor. Hart's screenplay is an adaptation of the original 1937 film, which was based on the original screenplay by Robert Carson, Dorothy Parker and Alan Campbell,  and from the same story by William A. Wellman and Carson, with uncredited input from six additional writers— David O. Selznick, Ben Hecht, Ring Lardner Jr., John Lee Mahin, Budd Schulberg and Adela Rogers St. Johns. In 2000, the 1954 film was selected for preservation in the United States National Film Registry by the Library of Congress as being "culturally, historically, or aesthetically significant." The film ranked #43 on the American Film Institute's 100 Years...100 Passions list in 2002 and #7 on its list of greatest musicals in 2006. The song " The Man That Got Away" was ranked #11 on AFI's list of 100 top songs in films. Garland had not made a film since she had negotiated release from her MGM contract soon after filming began on Royal Wedding in 1950, and the film was promoted heavily as her comeback. For her performance in A Star is Born, Garland was nominated for the Academy Award for Best Actress. NBC, which was televising the ceremony, sent a film crew to the hospital room where she was recuperating after giving birth to her son Joey in order to carry her acceptance speech live if she won, but she lost to Grace Kelly for The Country Girl. It is the second of four official adaptations of A Star Is Born, with the first in 1937 starring Janet Gaynor and Fredric March, the third in 1976 starring Barbra Streisand and Kris Kristofferson and the fourth in 2018 starring Lady Gaga and Bradley Cooper. Esther Blodgett is a talented aspiring singer with a band, and Norman Maine is a former matinee idol with a career in the early stages of decline. When he arrives intoxicated at a function at the Shrine Auditorium, the studio publicist Matt Libby attempts to keep him away from reporters. After an angry exchange, Norman rushes away and bursts onto a stage where an orchestra is performing. Blodgett takes him by the hand and pretends he is part of the act, thereby turning a potentially embarrassing and disruptive moment into an opportunity for the audience to greet Norman with applause. Realizing that Esther has saved him from public humiliation, Norman thanks her and draws a heart on the wall with her lipstick. He invites her to dinner, and later watches her perform in an after-hours club while recognizing her impressive talent. He urges her to follow her dream and convinces her she can break into movies. Esther is surprised that someone of Norman's stature sees something special in her. He offers her a screen test and advises her to "sleep on it," promising to call her the next day. Esther tells Danny McGuire, her bandmate, that she's quitting their upcoming gig to pursue movies in L.A. Thinking she is crazy, he tries to talk her out of it, but Esther is determined. Norman is called away early in the morning to filming and then falls ill. He attempts to get a message to Esther but cannot remember her address. When she doesn't hear from him, she suspects he was insincere. Not disheartened, she takes jobs as a carhop and TV commercial singer to make ends meet, convinced she can make it, with or without Norman. Norman tries to find Esther, who's had to move from her apartment. Then he hears her singing on a television commercial and tracks her down. Studio head Oliver Niles believes Esther is just a passing fancy for the actor, but casts her in a small film role. The studio arbitrarily changes her name to Vicki Lester, which she finds out when she tries to pick up her paycheck. When Norman finally gets Niles to hear "Vicki" sing, he is impressed and she is cast in an important musical film, making her a huge success. Her relationship with Norman flourishes, and they wed.
As Vicki's career continues to flourish, Norman finds himself unemployed and going downhill fast—an alcoholic in a tough new film business which doesn't put up with it. Norman arrives, late and drunk, in the middle of Vicki's Oscar acceptance speech. He interrupts her speech, rambling and pacing back and forth in front of her. While begging for work from the assembled and embarrassed Hollywood community, he accidentally strikes Vicki in the face. Vicki continues working and tells Oliver that Norman has entered a sanitarium. After supporting him for so long, she worries about the effect of Norman's alcoholism on her, while acknowledging that he's trying very hard to overcome his addiction. Niles is amenable to offering Norman work, a gesture for which Vicki is grateful, thinking this may be just the boost her husband needs. At the racetrack, Norman runs into Libby, who taunts him and accuses him of living on Vicki's earnings. The resulting fight prompts Norman to go on a drinking binge; he is eventually arrested for being drunk and disorderly and receives ninety days in the city jail. Vicki bails him out and brings him home, where they are joined by Niles. Norman goes to bed but overhears Vicki telling Niles she will give up her career to take care of him. He also hears Oliver say that Norman ruined his own career with his drinking. Finally realizing what he's done to himself, Vicki, his career, and the people around him, Norman leaves his bed, tells Vicki cheerfully that he is going to go for a swim, walks into the ocean—and drowns himself. At Norman's funeral, Vicki is mobbed by reporters and insensitive fans. Despondent, Vicki becomes a recluse and refuses to see anyone. Finally, her old bandmate Danny convinces her she needs to attend a charity function because she constitutes the only good work Norman did and which he died trying to save. At the Shrine Auditorium, she notices the heart Norman drew on the wall on the night they met and for a moment seems to lose her composure. When she arrives on stage, the emcee tells her the event is being broadcast worldwide and asks her to say a few words to her fans. She says, "Hello, everybody. This is Mrs. Norman Maine," which prompts the crowd into a standing ovation. Judy Garland on location filming a scene as a restaurant carhop. In March 1954, a rough cut still missing several musical numbers was assembled, and Cukor had mixed feelings about it. When the last scene was filmed in the early morning hours of July 28, 1954, Cukor already had departed the production and was unwinding in Europe. The long "Born in a Trunk" sequence was added after Cukor had left, supervised by Garland's professional mentor Roger Edens. A Star Is Born cost more than $5 million,  making it one of the most expensive films ever made in Hollywood at that time. In its initial release, it did very well and attracted huge crowds. According to Variety, it grossed $6.1 million in US theatrical rentals. Time wrote Garland "gives what is just about the greatest one-woman show in modern movie history," and Newsweek said the film is "best classified as a thrilling personal triumph for Judy Garland. As an actress Miss Garland is more than adequate. As a mime and comedienne she is even better. But as a singer she can handle anything from torch songs and blues to ballads. In more ways than one, the picture is hers." When the Oscar for Best Actress went to Grace Kelly instead of Garland, Groucho Marx called it "the biggest robbery since Brink's." For years, Garland fans and film historians expressed great interest in viewing the missing footage from this film. Beginning about 1981, film preservationist Ronald Haver did extensive research of the Warner Bros. film vaults and located some of the missing scenes, including two complete musical numbers, "Here's What I'm Here For" and "Lose That Long Face". In 1983, a 176-minute restored (i.e. reconstructed) version was shown in theaters and then released on home video. The project was a collaboration between the Academy of Motion Picture Arts and Sciences and the studio. Some of the missing footage had to be reconstructed using pan and scan of production stills, accompanied by the restored dialogue. The original multi-track stereophonic sound was also restored. Within the next year, more discoveries would follow. In the spring of 1984, the restored A Star Is Born was again reissued and shown at the Ziegfeld Theatre in New York City and for this engagement, an outtake of Garland performing "The Man That Got Away' in a different costume and hairstyle was included. 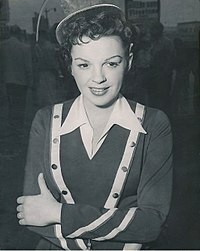 Also that year, when PBS was producing its documentary for Great Performances, Judy Garland: The Concert Years, another small piece of footage of A Star Is Born was found and shown for the very first time in the program - Garland singing " When My Sugar Walks Down the Street", which was deleted from the "Born In A Trunk" sequence. In 2010, an all new restoration kicked off the all new Turner Classic Movies Film Festival. Many were hoping that the film would be the long lost "George Cukor cut" but it was the Ron Haver Restoration. A Star Is Born, a remake itself, was again remade in 1976 with Barbra Streisand and Kris Kristofferson. The film was remade without permission in Bollywood as Aashiqui 2 in 2013. The original film is in the public domain. The soundtrack has never been out of print. It was originally released by Columbia Records in 1954 in 10-inch 78 rpm and 12-inch 331/3 rpm editions, and also on 7-inch 45 rpm records. In 1988, Columbia released the soundtrack on compact disc, taking the overture and the main musical numbers directly from the film's stereo soundtrack due to the fact no stereo pre-recordings for the soundtrack master existed for this number. In 2004, in commemoration of the film's 50th anniversary, Columbia, Legacy Recordings, and Sony Music Soundtrax released a nearly complete, digitally-remastered, expanded edition of the soundtrack. Due to the lack of a complete multitrack version of all songs and score from the film, the CD includes a mix of monaural and stereo elements in order to make as complete a soundtrack as possible. Due in part to the fact that some of the songs were not complete on the film soundtrack, as well as the fact that many of the original music stems had been lost or destroyed subsequent to original mono mixdown, numbers such as "Here's What I'm Here For" and "Lose That Long Face" are taken from the original mono LP masters. Other numbers such as "Gotta Have Me Go with You" are mostly in stereo, save for brief sections where the mono soundtrack album master was used in order to remove various endemic plot-related sound effects from the track. All of the instrumental tracks are in mono as well due to the fact that the original elements have been lost or destroyed. The 2004 soundtrack also includes three vocal outtakes – an alternative vocal for the reprise of "It's a New World" that Esther sings while Norman goes for his final swim; "When My Sugar Walks Down the Street", which was intended to be part of the "Born In a Trunk" sequence, but was deleted for time constraints; and "The Trinidad Coconut Oil Shampoo Commercial", which was taken from the only surviving recording of the complete track, a very worn acetate artist reference disc. In addition, much of the instrumental portion of the 2004 soundtrack contains partial or whole outtakes. This CD also sees the first CD release of the complete version of "Gotta Have Me Go with You" with the full introduction, as well as "The Man That Got Away" with an expanded introduction not used in the original film. The original Columbia 1954 mono vinyl version of the soundtrack has been released on CD in Britain by Prism Leisure and is also available for digital download. This version includes bonus tracks of Judy Garland's Decca recordings of songs from other films. Warner Home Video released the 176-minute 1983 "restored" version on DVD in letterbox widescreen format on September 19, 2000. The film was digitally remastered from original CinemaScope elements for superior picture clarity and optimal audio vitality and features an remastered English audio soundtrack in Dolby Digital 5.1 and subtitles in English and French. Bonus features include the network telecast of the September 29, 1954 Hollywood premiere at the Pantages Theatre; highlights from the post-premiere party at the Cocoanut Grove; three alternative filmings of "The Man That Got Away" with additional original recording session music; a short musical sequence that appeared in a test screening but was deleted before the film's official premiere, "When My Sugar Walks Down the Street" (which was to be part of the extended "Born in a Trunk" sequence); and the theatrical trailers for this, the 1937 original, and the 1976 remake. On June 22, 2010, Warner Home Video released the film on Blu-ray and DVD. The original production negative has been restored and transferred to video at 6K resolution,  one of the first films transferred at such a high rate, however according to a Warner press release, no new footage has been found. The restoration "has meticulously preserved and restored Ronald Haver's 176-minute version of A Star Is Born to its original luster, bringing back the brilliant, saturated colors and crisp picture." ^ Ben Hecht, Ring Lardner Jr., John Lee Mahin, Budd Schulberg, David O. Selznick and Adela Rogers St. Johns performed uncredited work on the screen story. ^ a b Box Office Information for A Star Is Born. Box Office Mojo. Retrieved August 27, 2013. ^ "A Star is Born 1954". Turner Classic Movies. Atlanta: Turner Broadcasting System ( Time Warner). Retrieved September 5, 2016. ^ "A Star is Born 1937". Turner Classic Movies. Atlanta: Turner Broadcasting System ( Time Warner). Retrieved September 5, 2016. ^ a b c "Judy Garland Database film review: "A Star Is Born"". Archived from the original on 2009-01-20. ^ Jaynes, Barbara Grant; Trachtenberg, Robert. Cary Grant: A Class Apart. Burbank, California: Turner Classic Movies (TCM) and Turner Entertainment. 2004. ^ "Movie Review – The Screen: 'A Star Is Born' Bows; Judy Garland, James Mason in Top Roles". NYTimes.com. ^ "A Star Is Born (1954)". Rotten Tomatoes. Fandango. Retrieved October 3, 2018. ^ McNary, Dave. "Lady Gaga-Bradley Cooper's 'A Star Is Born' Gets 2018 Release Date". Variety.com. Archived from the original on 8 January 2017. Retrieved 9 November 2016. ^ "Here's how all 4 versions of 'A Star Is Born' did at the Oscars". Retrieved 25 February 2019. ^ "The Truth About 6K - Sound & Vision". Wikimedia Commons has media related to A Star Is Born. A Star Is Born on Lux Radio Theater: December 28, 1942. Starring Judy Garland and Walter Pidgeon.
" The Man That Got Away"
" Always Remember Us This Way"
" Look What I Found"
" Why Did You Do That?" " I'll Never Love Again"